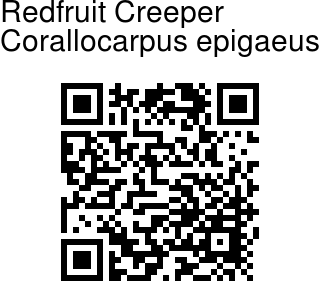 Redfruit Creeper is a vine up to 4 m long with tuberous root. Leaves are 3-5 angled, up to 8 x 8 cm, velvet-hairy, tip pointed, base heart-shaped, toothed; leaf-stalk up to 3 cm. 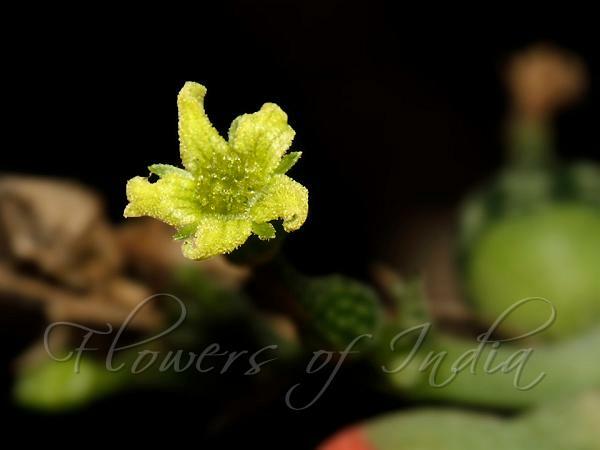 Flowers are monoecious, yellow; male flowers in racemes, up to 1 cm; flower-cluster-stalks up to 5 cm, stout. Flower are 2 mm across, velvet-hairy; stamens 3, erect. Female flowers are solitary, 2 mm across; ovary 4 mm, oblong, beaked. Fruit is 1.5 x 1 cm, ellipsoid, beaked, hairless, smooth, 10-20 mm long, 5-8 mm across, red except for the greenish base and portion of beak. Redfruit Creeper is India, Pakistan (Punjab, Sind and Baluchistan), Tropical East Africa and Sudan. Medicinal uses: Tubers are believed to cleanse the wounds, help deal with obesity, skin disease, tumours,cough,bronchitis. Identification credit: P.S. Sivaprasad Photographed in Nilambur, Distt. Coimbatore, Tamil Nadu.